We love being part of such a friendly village. The children take an active role as members of the Stebbing community. 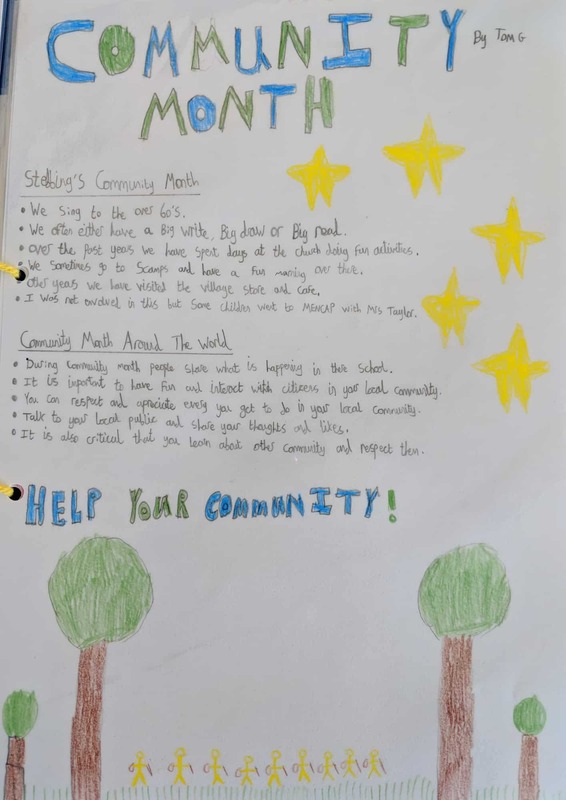 Each year we plan a Community month. 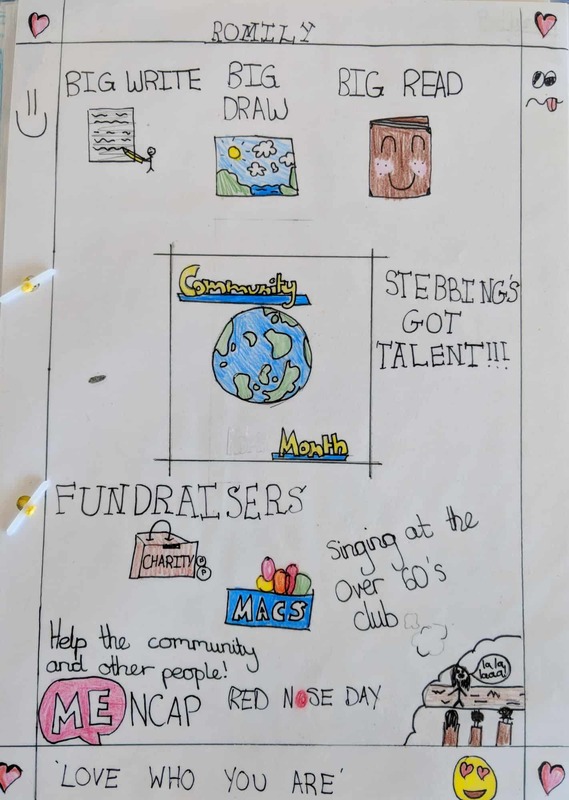 This gives children the opportunity to find out more about Stebbing; volunteer at different organisations and invite villagers into school to enjoy something special at school. Previous years have included: learning how to ring the church bells; helping at Little Harts playgroup; volunteering in the village shop; litter picking around the village and visiting the local parks. Take a look at these posters which give a flavour of the events we take part in during Community Month. We also like to be a part of the special events which happen in the village. We enjoy joining in with the Stebbing village fete; the scarecrow and open gardens weekend; the garden club show and other annual events that occur during the year. Talent camp is a sports camp that is run by Jackie Colman as part of the USSP; The Uttlesford School Sport Partnership. Specific coaches come to Joyce Frankland Academy to teach different sports such as: tennis, handball and fencing. The sports that you do are usually sports that you wouldn’t play or do, this teaches you that if you don’t succeed in one sport then there are other options! It takes place during the May bank holiday for three days. There is a year 2 talent camp and a year 6 talent camp but I’m talking from a year 6 point of view. On one of the three days you go to Lee Valley Athletics Centre where you can hopefully meet an athlete and you do a variety of sports with amazing coaches. To get into the talent camp you have to do trials so that they can pick the best people to coach for the three days. You do different things such as: long jump, vertical jump and the dreaded 12 minute cooper run which is where you continuously run for twelve minutes. The trials usually happen at the start of the year and you find out if you have got in during February time. Your teacher chooses the people who go to the trials so you have to work your socks off in PE if you want to go to talent camp! Personally I think that talent camp is a sensational idea because as I have already said it teaches you a variety of sports and that there are more sports than just football! It is good for team building skills as well as making new friends that you might meet during secondary. I sometimes get bored during the half terms so doing three days of sports is a great way to have fun and enjoy the sun! I felt really lucky to be one of the twelve girls out of forty-two people or hopefully soon to be athletes! It was an amazing experience and I think that everyone should embrace it if they get in! Being a Year 6 is a difficult but interesting role with lots of challenges and responsibilities. There are three main jobs a Year 6 can have: A House Leader, Sports Captain and House Captain. I was voted a House Leader for Oak House, which I loved doing as it involved lots of responsibilities, such as: helping on Sports Day, leading assemblies, being in charge of an assigned class and we had regular meetings with the head teacher to help make the school a better place. We also had the one and only SATs towards the end of Year 6. We worked hard all year to learn all the things that we needed to learn. However, the SATs are not as scary as some people think, you get breakfast club before doing an hour or so of hard work for your school for four days. It doesn’t matter what scores you get as long as you try your best and do it for the school. Another challenge for Year 6 is the prospect of leaving primary and moving onto secondary school. This can be daunting but is not altogether bad. Everyone supported me and there were a lot of transition events to prepare us for this change. It was with sadness in my heart that I left Stebbing but I knew I must do it in the end and Stebbing has prepared me well for this next step in my education. The last thing I have to say about being a Year 6 is that it is lots of fun. In Reception, the Year 6 pupils seemed so grown up but now I am that stage I don’t feel grown up at all. Looking back on my year, the memories that will last are the ones of me just having fun with my friends, such as when we went away for a week to take part in lots of adventures; all of the other fun trips throughout the year e.g. Cinema, Tower of London and Kidzania and all of the fun activities we did in school. I want to say a special thank you to Stebbing Primary School for having me for seven years and I hope my new school will be as great as Stebbing.